I recently had a Garden Burger at one of our local cantinas, The Red Hen. 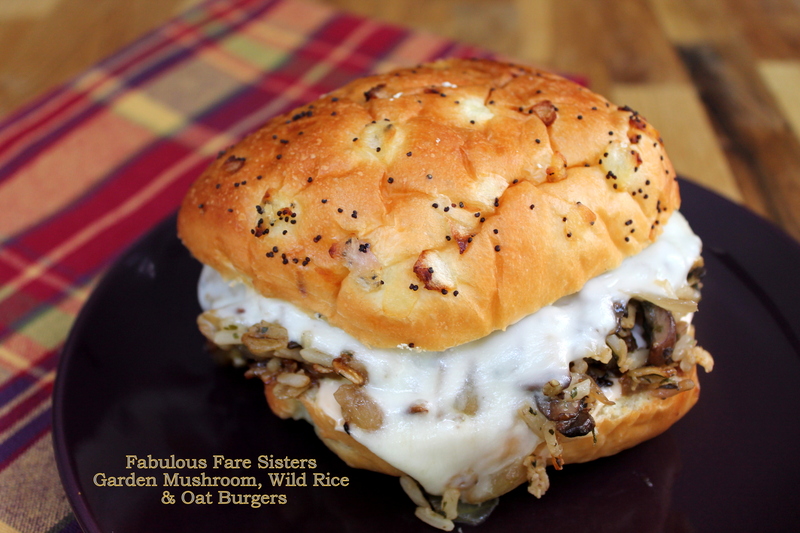 The ingredients sounded like a great idea: mushrooms, onions, rolled oats, mozzarella and long grain rice – but I was disappointed…it really lacked flavor! So I decided to give those ingredients a try in my kitchen – adding a pinch of zing….and it worked! I’ll be making these more often this summer for everyone to enjoy…. Gather your ingredients. Prepare Long Grain Wild Rice as package directs; set aside 2 cups. Remove the stems from the bottom of the cremini mushrooms and chop. Peel and dice the vidalia onion. Heat the olive oil & butter in a large skillet. Sauté the mushrooms (alone) for 8 minutes. Add the onions and seasonings and sauté another 8 minutes. Stir in the rolled oats and the cooked wild rice. Remove from heat and place contents in a mixing bowl; cool slightly. These burgers don’t stay together like a traditional ‘burger’ so at this point you can add the egg to help the binding process. Shape into four patties. Heat a skillet on medium-high heat, spray with cooking spray. Cook Burgers 3-4 minutes on each side to crisp them up a bit; carefully flipping burgers so they remain intact. Top with a couple of slices of mozzarella cheese and cover skillet – allowing mozzarella to melt. Meanwhile make the Chipotle Ranch Mayonnaise: In a small bowl whisk together 2 tablespoons mayonnaise and 1 tablespoon Marie’s Creamy Chipotle Ranch sauce. To assemble: Smother bottom onion bun with some Chipotle Ranch Mayo. 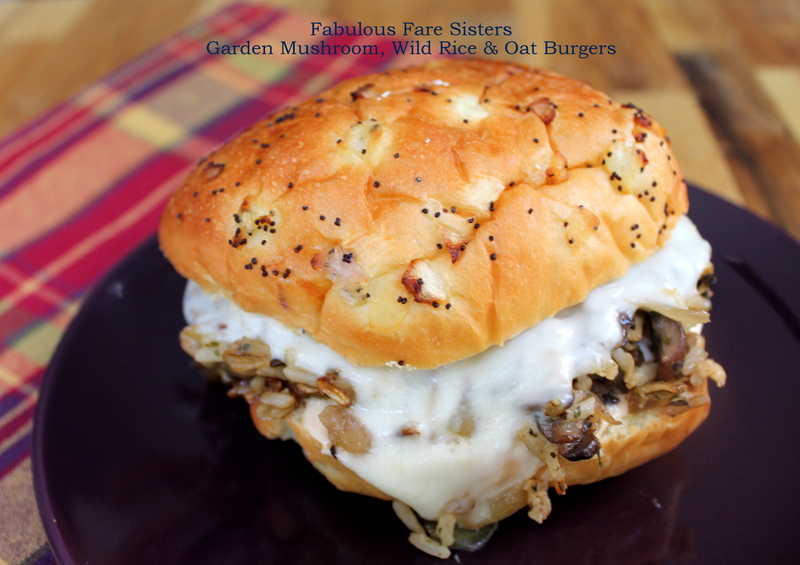 Place Garden Mushroom, Wild Rice & Oat Burger on bottom bun and top with remaining onion bun. Serve immediately! Get some extra napkins ’cause this baby’s delicious…but messy!! This recipe has been shared on Senior Salon, Throwback Thursday, Fiesta Friday, Funtastic Friday and Foodie FriDIY along with Saucy Saturdays & The Pin Junkie…go check it out and then visit some other great sites! What a great alternative to a regular burger. Thanks for sharing with us at Throwback Thursday, Pinned! You could do a whole book just on your different burgers! Looks like another good one! Yum! This looks so delicious Linda! This sandwich has my stomach growling! It is very unique and not sure Mr. picky pants is ready for it yet! My carnivore would say the same thing! Great recipe Linda. Well done. The rice ingredient is very creative! Oh now this is interesting….very odd combination yet I’m turned on by it. It looks really, really yummy too, haha!!! All these ingredients are favorites on mine ESPECIALLY mushrooms and onion rolls. I am jealous-trying to cut back on bread-SO HARD.